Be sure to test your luck with Exotic Chest Engrams! This sniper rifle hits like it has the Traveler’s weight behind it. It has very high Impact rating, so precision shots will be rewarded. It packs quite a punch in PvP too, but usually you’ll want to stick to using it in PvE. Ice Breaker is one of the best sniper rifles for PvE. The utility of regenerating ammo can’t be understated, so if you don’t have this, now you’ve got another chance. It will also replenish some of your other special weapon ammo! If you are out of special ammo, switch to this gun and wait for a few seconds, and then switch back to your special weapon of choice. No Backpack: Cannot be reloaded. Regenerates ammo over time. Mulligan: Missing a shot has a chance to return ammo directly to the magazine. Ice Breaker: Ice Breaker’s victims spontaneously combust, dealing damage to others nearby. Helm of Saint-14 is what a PvE Defender Titan dreams about. With bolts, a crest and big metal plates, Helm of Saint-14 looks like a futuristic knight, and the luminous purple glow is also a very nice touch. This helm has an OK roll of 106/114 Intellect (max is about 130), more than the last time it was sold. This is a perfect helmet for a Defender – buy it! They’ve got 91/98 Discipline, slightly more than the last time they were sold. These are not bad gauntlets for PvP, but ultimately we recommended that you wait for an Exotic helm such as Achlyophage Symbiote. A first-time sale, this intimidating helmet will give you more durability when using the Nova Bomb and Super energy with grenade kills. This helmet has a low stat roll of only 94/101 Intellect, while the maximum could reach up to ~130. Delusions of Grandeur – You take reduced damage while using your Nova Bomb. Your siphon abilities are also improved. Personally I’d much rather have Obsidian Mind for PvE, but you should probably pick this up for PvP; who knows when Xur will sell it again. Energy Drain is a 5 second buff that accelerates the rate of grenade recharge and can be increased to 8 seconds with Delusions of Grandeur. This helm is designed for the Voidwalker who wants to use the Soul Rip/Embrace the Void talents. It entirely revolves around giving you a larger up-time on the Energy Drain buff, which will give you more grenades (leading to more kills). 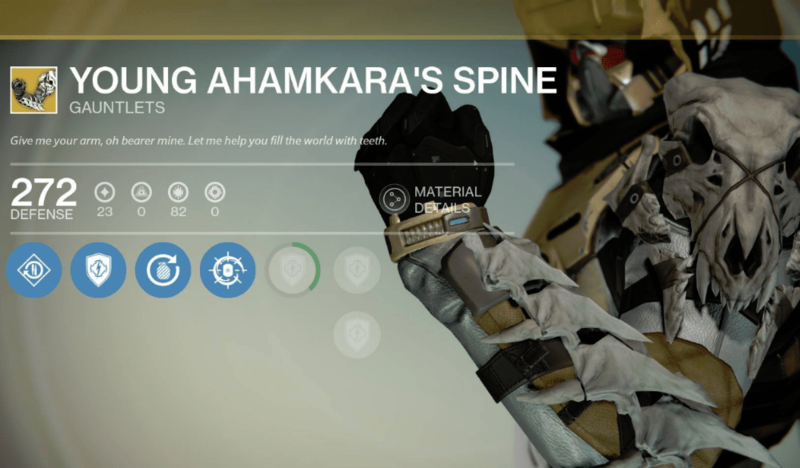 If you’d like to use your grenades and Super a lot, the Skull of Dire Ahamkara will allow you to throw grenades further, which hopefully results in better accuracy. Energy Projection definitely isn’t the most useful perk to have though, and may never even help you. This helm will give you Intellect, increasing the passive charge of your Super, which meshes well with the other two perks. The increased effectiveness of your Energy Drain ability (“siphon”) is wonderful, as it’ll allow you to have more grenades at your disposal. More grenade kills means more Nova Bombs!